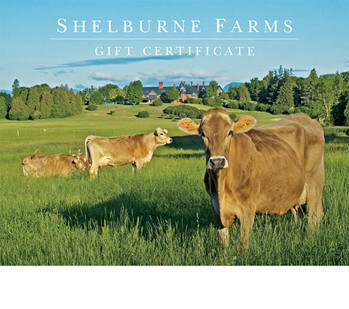 Give the experience of Shelburne Farms to a family member, friend, or colleague with this Farmwide Gift Certificate. They may apply it as they choose to a membership, or to any Farm program, product, or service, including an overnight stay or meal. Please enter "To" and "From" fields below. If sending a gift certificate directly to the recipient, you will have an opportunity to add a gift message at check out. Note: Membership discount and shipping charges do not apply to gift certificates.